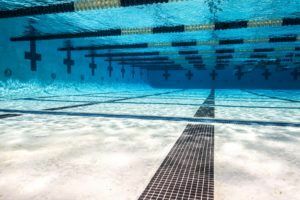 Grant Shoults of Santa Margarita and Elise Garcia of Crean Lutheran each notched a pair of individual wins and came away with Swimmer of the Meet honors at the 44th Annual Foothill Swim Games at Foothill High School in Santa Ana. 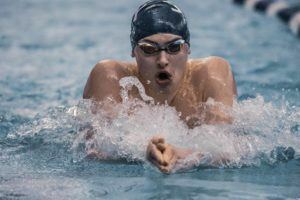 After girls’ prelims on Thursday and boys’ prelims on Friday, the top 16 qualifiers in each event came together for A and B finals on Saturday. Crean Lutheran kicked off the girls’ meet with a 1:45.15 win in the medley relay from senior Emily Eastin (25.49), junior Rachel Taylor (30.26), senior Tianna Jorgenson (26.13), and sophomore Garcia (23.27). Garcia then scored individual wins in the 50 free (23.54) and 100 fly (54.29). In the latter race, she out-touched teammate Eastin by a mere .21. 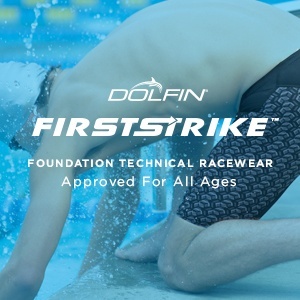 Eastin, meanwhile, went on to win the 100 back in 54.09 over Mater Dei senior Aislinn Light (54.63), University freshman Riley Lexvold (55.18), and Foothill senior Courtney Mykkanen (55.68). Eastin was just .30 off her meet record from 2015. Crean Lutheran also won the 200 free relay in 1:35.91 with a quartet featuring senior Katia Young (25.29), Jorgenson (23.91), Eastin (23.34), and Garcia (23.37). Santa Margarita freshman Mackenzie Degn, who placed second to Garcia in the 50 free by .06, won a close 100 free ahead of Light, 50.74 to 50.99. Degn’s 23.60 in the 50 free was a lifetime-best by 2/10. Buchanan junior Stephanie Bartel (51.76) squeezed past top-seeded Samantha Shelton of Santa Margarita (51.90) for third place in the 100 free. Shelton, a sophomore, won the 200 free with a commanding 1:50.30; second place went to Irvine sophomore Julia Wright (1:52.13), whose second half took her past Foothills’ Mykkanen (1:52.35). Crean Lutheran senior Brittany Kampfer won the 500 free in 4:53.90. Stephanie Su, a freshman from Mater Dei, placed second with 4:55.17. Irvine’s Wright was third with 4:58.89. University’s Lexvold clocked a personal-best 2:02.69 to win the 200 IM in 2:02.69. Coming in second was Santa Margarita sophomore Isabelle Odgers, who took 2.1 seconds off her previous best time to go 2:04.69. Freshman Amanda Hsieh of Northwood was third to the wall in 2:05.72; that was her best by nearly 3 seconds. Odgers also won the 100 breast with a new PB of 1:04.06. Crean’s Jimena Martinez (1:05.02) and Taylor (1:05.32) went 2-3. Santa Margarita ended the meet with a 3:32.56 win in the 400 free relay and team victory in the girls’ meet. Final scores: 1. Santa Margarita 447; 2. Crean Lutheran 339; 3. Foothill 258; 4. Mater Dei 234; 5. Irvine 194.5; 6. Northwood 180.5; 7; University 179; 8. Laguna Beach 113; 9. Buchanan 91; 10. Beckman 49; 11. Yorba Linda 22; 12. Tustin 2. After a 1:36.67 Northwood win in the 200 medley relay from senior Nick Thorson (25.54), sophomore Henry Wu (27.00), sophomore Gabe Munoz (23.06), and sophomore Hunter Hitchens (21.07), Santa Margarita senior Shoults kicked off the individual events with a new meet record in the 200 free. 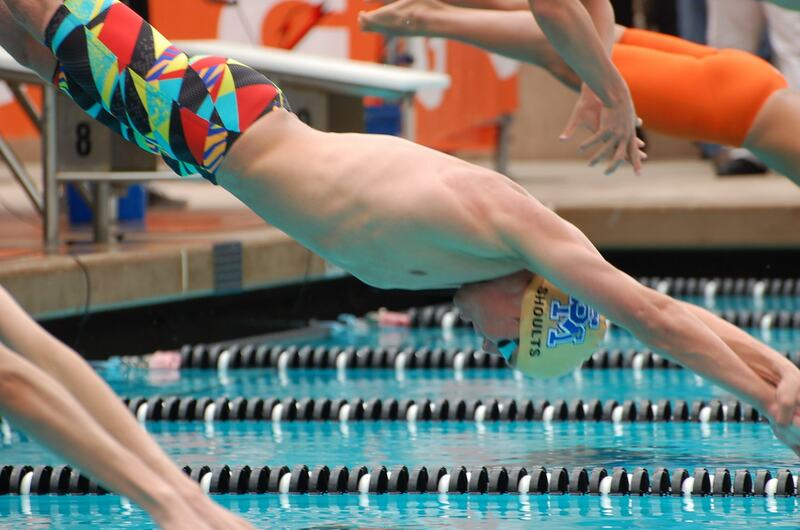 Shoults lowered his own mark, set in 2014, by 3.6 seconds with a 1:35.64, his fifth-fastest swim ever, and just 1.1 off his lifetime best of 1:34.54 with which he set the national independent school record at CIF last May. Junior Cameron Karkoska of Laguna Beach finished second in the 200 free with 1:42.23; Northwood’s Hitchens was third (1:43.09). 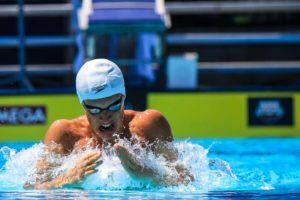 Shoults’ next assault on the record-book was in the 100 fly, where he erased a 2002 mark of 48.87 set by Milorad Cavic. Shoults won in 48.11, lowering his previous best time by 6/10. 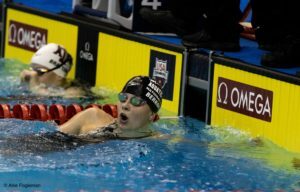 Karkoska later won the 100 breast in 58.54. Northwood’s Wu was second in 58.65. Laguna Beach junior Max Morgan was third with 59.36. Mater Dei junior Christian Hockenbury won both sprint freestyles, going 20.94 in the 50 and 45.85 in the 100. In the latter, Hitchens (46.83) and Morgan (46.97) came in second and third. Sawyer Farmer of Newport Harbor was fourth in the 100 (47.34) and runner-up in the 50 (21.76). Hockenbury anchored Mater Dei’s 200 free relay in 20.17; he combined with teammates, junior Payton Thomas (22.62), junior Kirby Slater (21.94), and senior Clint Hurdle (21.77), for a new meet record of 1:26.50, taking .31 off Santa Margarita’s 2015 mark. Also during that race, Santa Margarita’s Shoults broke 21 seconds for the first time in the 50 free leading off their relay with 20.75. Northwood’s Munoz won a hard-fought race in the 200 IM with 1:55.20. He edged Santa Margarita’s Tu (1:55.45) and Yorba Linda freshman Nick Ding (1:55.86) in a stroke-for-stroke battle through most of the race. 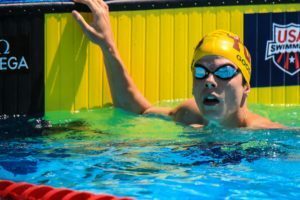 Crean Lutheran junior Kevin Chao lowered his PB by 1/10 when he won the 500 free in 4:34.13, just holding off Buchanan junior Tanner Olmos (4:34.50). Junior Andrew Knoell of University led a 1-2-3 sweep in the 100 back; Knoell won with 50.89 ahead of teammates junior Sean Messer (51.24) and senior Jared Yoshihara (52.55). Santa Margarita closed the meet with a 3:07.99 win in the 400 free relay from Tu (46.98), freshman Noah Brune (48.98), senior Marc Morizono (47.33), and Shoults (44.70). Final scores: 1. Mater Dei 420; 2. Northwood 348; 3. University 330; 4. Santa Margarita 281.5; 5. Buchanan 196; 6. Foothill 131.5; 7. Irvine 127; 8. Newport Harbor 119; 9. Beckman 70; 10. Laguna Beach 69; 11. Yorba Linda 55; 12. Crean Lutheran 20.